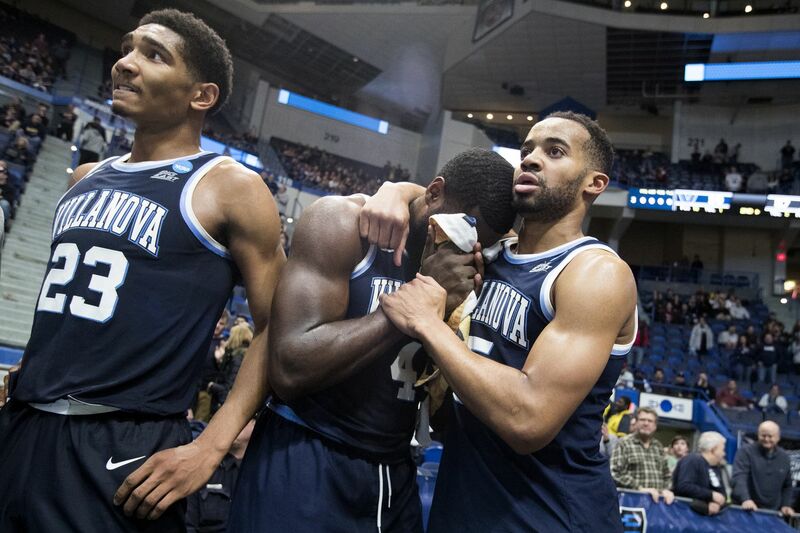 L-R; Jermaine Samuels, Eric Paschall, and Phil Booth of Villanova in the final moments of their loss to Purdue in the 2nd round NCAA Tournament game at the XL Center in Hartford, CT on March 23, 2019. HARTFORD, Conn. – Villanova coach Jay Wright felt that Purdue sharpshooter Carsen Edwards had the ability to make a high volume of three-point shots, and his worst fears were realized Saturday night when the Boilermakers ended the season for defending national champion Wildcats. Edwards, a 6-foot-1 junior, set the tone for the second-round NCAA Tournament game with four three-point baskets in the opening 5 ½ minutes and wound up with a career-high 42 points to send the Wildcats down to a nightmarish 87-61 defeat before 15,031 at XL Center. Led by Eric Paschall with 19 points and Phil Booth with 15, the Wildcats ended the season with a 26-10 record after suffering their first 20-plus point loss in the NCAA Tournament since 1970, when they lost to Bob Lanier and St. Bonaventure, 97-74. Edwards went 12 of 21 from the field and hit nine three-point baskets in 16 attempts. He scored 17 points in the first half to propel Purdue to a 43-24 halftime lead and had eight points in a 16-0 run in the opening 5 minutes, 42 seconds of the second half as the Boilermakers built their lead to 35, 59-24. Carsen Edwards, right, of Purdue collides with Phil Booth of Villanova during the first half of a 2nd round NCAA Tournament game at the XL Center in Hartford, CT on March 23, 2019. For the game, Purdue hit 16 threes on 30 attempts. The team went 9-of-30 in Thursday night’s first-round win over Old Dominion. “We as a staff did not get our guys … we tried to make them understand their ability to hit threes and execute their offense with great precision, and we just didn’t have them ready from the start,” Wright said. “We gave up a lot of threes early, uncontested threes. Then once you get a great shooting team like that going, and then you’re overaggressive trying to take away those threes, they start slipping, they get you on the inside, and they get you on offensive rebounds. Purdue had 10 offensive rebounds and scored 10 second-chance points in building its halftime lead and dominated both boards, finishing with a 42-24 rebound advantage. Matt Haarms, a 7-3 sophomore, had a game-high nine rebounds to go with 18 points. The Wildcats led only once, 5-4, for a total of 23 seconds. Then came Edwards’ early flurry, which enabled the Boilermakers to get out to a 25-12 lead before the first half was nine minutes old. Paschall’s conventional three-point play reduced the deficit to 27-20 with 7:46 remaining in the half. But after Booth’s basket with just over 5 minutes to go made it 32-22, the Wildcats went ice cold, scoring just two points in the next 11 minutes. They made just one of their last five shots in the first half and started the second half 0-for-8. The Boilermakers scored 16 consecutive points in the opening 5:42 of the second half and took their largest lead, 59-24. The 35 points was the largest deficit the Wildcats had faced all season, topping the 32-point gap in the Michigan loss last November. The Wildcats never stopped playing, but the distance was too great. They narrowed the gap to 22 with a 10-0 run that made it 64-42 with 9:40 to play, and a three-ball by Jermaine Samuels made the score 77-56 with 3:27 remaining. But the game was over, and Villanova fans saved their last and loudest ovation for when Wright lifted Booth and Paschall with 57.6 seconds left, ending their careers as Wildcats players. Booth’s point total helped him surpass 1,500 points for his career, making him the ninth Villanova player to reach that milestone plus 300 assists in their career. Paschall, who played his final three years with the Wildcats after transferring from Fordham, was more emotional. Phil Booth of Villanova in the locker room following their loss to Purdue in the 2nd round NCAA Tournament game at the XL Center in Hartford, CT on March 23, 2019.